and every other day of the year that you know freedom. So reads the inscription etched into the white marble tomb that marks the resting place of America's official unknown soldiers. The Tomb of the Unknowns at Arlington National Cemetery remains one of the United States' most revered sites, a permanent reminder of this country's commitment to honor those who died fighting for its freedom. Last week, [Sept 18, 2003] that commitment was upheld in a way some people might not have even noticed or even thought about. When practically every government employee in Washington was beating a hasty retreat to avoid the aftereffects of Hurricane Isabel, a small group of men decided their commitment to duty, honor and country was more important than personal safety or comfort. Tomb Guard Sentinels, the elite soldiers of the 3rd U.S. Infantry regiment chosen to act as guards at the Tomb, opted to sustain their constant vigil at the Tomb of the Unknowns rather than flee the oncoming bad weather. To them it was a matter of honoring their personal and professional obligations to the men and women who served before them and who serve now - and obviously do not have the luxury of serving their country only when skies are blue and the sun shines down upon them. Although the Tomb of the Unknowns is watched over by Tomb Guards 24 hours a day, 365 days a year regardless of weather conditions, to have soldiers so duty-bound as to ignore their own personal well-being is an example of real patriotism and a real reminder of the sacrifices made to secure the principles of liberty. 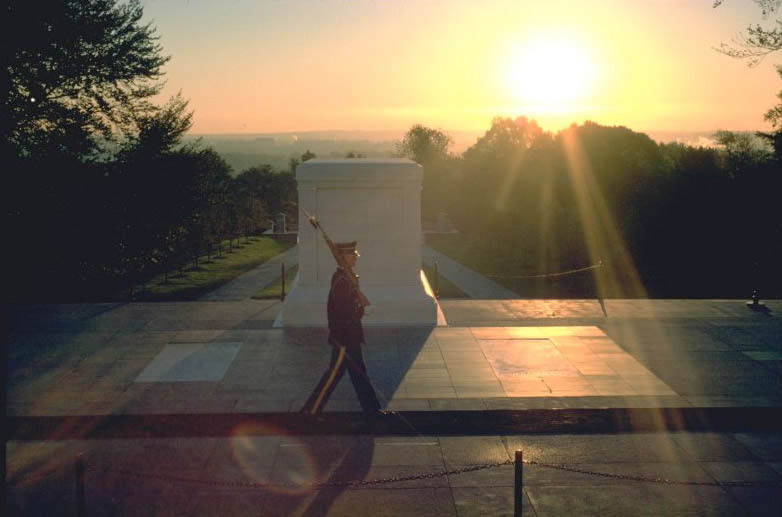 The Tomb of the Unknowns holds three sets of remains, one each from World War I, World War II, and the Korean War. A fourth set of remains from the Vietnam War used to be part of this august company but was formally disinterred in 1998 after DNA testing determined them to belong to First Lieutenant Michael Joseph Blassie. Lt. Blassie is now buried in his hometown of St. Louis, Missouri. The tomb is guarded 24 hours a day and 365 days a year by specially chosen soldiers of the 3rd Infantry Regiment (Old Guard) stationed at nearby Fort Myer. In addition to the main Tomb of the Unknowns, there are two additional burial sites at Arlington for Unknowns... The War of 1812 site with 14 unknown soldiers and the 1866 Civil War Site with the remains of 2,111 unknown soldiers. These were the first unknown soldiers buried at Arlington. 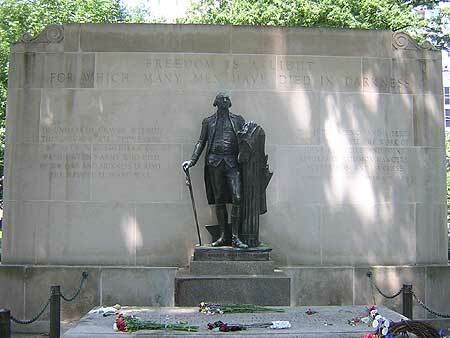 There is another, the Tomb of the Unknown Soldiers of Washington's Army in Washington Square, Philadelphia. Various messages engraved on the wall of the memorial include: "Freedom is a light for which many men have died in darkness"; "The independence and liberty you possess are the work of joint councils and joint efforts, of common dangers, suffering, and success [Washington Farewell Address, Sept. 17, 1796]"; and "In unmarked graves within this square lie thousands of unknown soldiers of Washington's Army who died of wounds and sickness during the Revolutionary War." The tomb of the Unknown Soldier itself bears the words:"Beneath this stone rests a soldier of Washington's army who died to give you liberty." God Bless the them all!! !